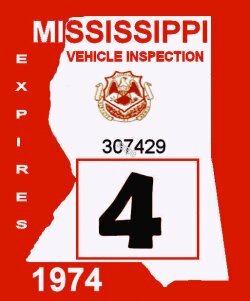 1974 Mississippi Inspection sticker - $20.00 : Bob Hoyts Classic Inspection Stickers, Add a Final Touch to your Restoration! This 1974 Mississippi Inspection Sticker has been restored and reproduced directly from an original, front and back. For an additional $5.00 you can order a different month shown on the front of the sticker.